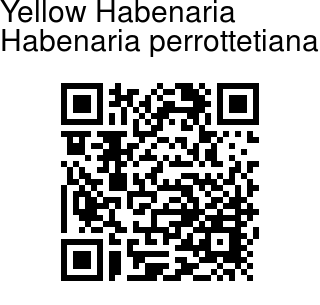 Yellow Habenaria is a terrestrial orchid with stem 20-50 cm tall. Leaves are up to 7 x 3 cm, elliptic-oblong, pointed. Flowers are yellow, few, in about 15 cm long spike; bracts 3 x 1.7 cm, broadly elliptic, pointed-apiculate, leaf-like, almost concealing the flowers. Dorsal sepal is 15 x 9 mm, ovate-oblong, blunt, 5-veined; lateral sepals 15 x 9 mm, elliptic, blunt, 7-veined; petals 15 x 4 mm, obliquely oblong, pointed, 4-veined; spur 15 mm long, club-shaped. 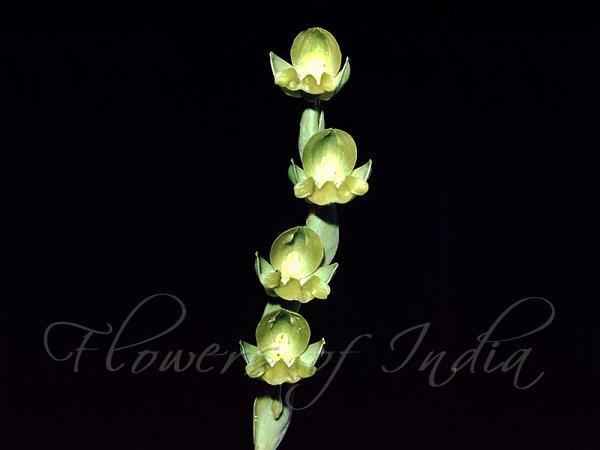 Yellow Habenaria is endemic to Peninsular India. Flowering: September-October.